The main menu does not have many features at all. Upon pressing the button you'll be brought to a screen with two options: NEW GAME and OPTION. NEW GAME will start a new game and get on with things. However, you might want to visit the OPTION menu to tune things to your idea of perfection. Below is a list of the settings and information about those settings. After pressing the new game button, Dr. Oak will show up and talk to you about Pokémon. After speaking, he lets you choose you and your rival's name. There are preset names for you to choose from. ASH and JACK in Red, and GARY and JOHN are pretty normal. However, the first preset name will either be RED or BLUE depending on your version. After choosing your own name, he'll present you with his grandson who has apparently been your rival ever since you were babies. You can choose his name as well, only because Oak forgot. The first choice will again be BLUE or RED (if you're playing Red your rival's name will be BLUE, if you're playing Blue it will be RED). Red artwork from Fire Red & Leaf Green. Red is the first ever protagonist in any Pokemon game. He's only playable in the first generation of games and the remakes, but he does appear in Red, Blue and Yellow, Gold, Silver and Crystal, Heart Gold and Soul Silver, and Black 2 and White 2. He's also a playable character in Super Smash Bros. Brawl, Stadium (japanese), and Stadium 2. Red is the most iconic member of the Pokemon franchise, often being appraised as the best Pokemon trainer ever. Ash Ketchum from the anime is based off of this character. Red has extremely pale brown hair that looks grey, a red and white cap and grey eyes. Matching his cap, he wears a red, sleeveless jacket with a white collar and stripes. He has a black undershirt with a yellow backpack over his shoulders. He wears light blue shaggy jeans with black and red shoes. He appears to have a watch on his wrist and tosses a Pokéball in one hand and puts his hand in his pocket with the other. In earlier artwork of him, he had dark black hair. He has a fierce stern expression on his face and a solemn demeanor. In any of the Pokemon games, he never says a word. When dialogue does happen, the only text that appears is "..." He obviously likes to be alone. In fact, he sits on top of Mt. Silver to train with his level 88 Pikachu. Most refer to him, even in regions outside Kanto, as the Champion, The Ultimate Pokemon Trainer, Hero of Kanto, and The Pokemon Champion. Blue artwork from Fire Red and Leaf Green. 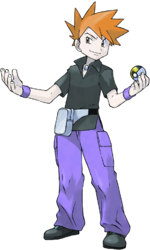 Blue Oak is the first ever rival in any Pokemon game and the grandson of Professor Oak. He's not a playable character, but he makes appearances in Red, Blue and Yellow, Gold, Silver and Crystal, Heart Gold and Soul Silver, and Black 2 and White 2. He also appears in Stadium 1 and 2. Although Blue is annoying and cocky, he's an amazing Pokemon Trainer who defeated the Elite 4. He's also good enough to be the best gym leader in Kanto in Geration 1. Gary Oak from the anime is based off of blue. Blue has orange hair with a black shirt and shaggy, purple jeans. He has 2 purple wrist bands and is holding an Ultra Ball. He wears a pouch wrapped around his waist and a necklace with a some sort of precious stone hanging from it. He also wears black shows with a small amount of light blue. He has pretty long legs. Other artwork of him shows brown or pale brown hair, like Red's. Blue posseses a "bring it on" or "show me the best you got" expression on his face. He usually ends conversations with "Smell ya later!" He's a cocky, confident, and competitive young boy who seeks the same goals as Red. He has become the league champion for a short amount of time before Red claimed his spot. After the events of RBY, he took Giovanni's spot as the Viridian City Gym Leader. You can battle him in GSC and HGSS. He has no specific type, but hands you an Earth Badge anyways when you beat him. In GSC, he seems to had a change of personality by checking out the wreckage of Cinnabar Island and saying, "Who are you? Well, it's plain to see that you're a trainer… My name's Blue. I was once the Champion, although it was for only a short time… That meddling Red did me in… Anyway, what do you want? You want to challenge me or something? …I hate to say it, but I'm not in the mood for a battle now. Take a good look around you… A volcano erupts, and just like that, a whole town disappears. We can go on winning and losing in Pokémon. But if nature so much as twitches, we can lose in a second. … That's the way it is… But, anyway, I'm still a trainer. If I see a strong opponent, it makes me want to battle. If you want to battle me, come to the Viridian Gym. I'll take you on then." Moving around is in a grid/tile style. Moving up, right, down, or left will move one space in that direction. For more information on this topic, visit the Controls section. The whole game is centered around Pokémon battling. Battling consists of fighting an opposing trainer with Pokémon or fighting a wild Pokémon with your Pokémon. For more information on this topic, visit the Competitive Battling page. This page was last edited on 15 October 2016, at 14:11.